Denny Jump (Bellevue, WA, United States) on 4 January 2012 in Landscape & Rural and Portfolio. Hunterdon County, New Jersey - Trees now bare for the winter season cast their reflections on a cold, calm pond. Evocates me After the Gold Rush, by Neil Young. Love the golden hues, really well spotted Mr J! I feel like I could walk right across to that shoreline - providing I was wearing the Golden Boots ! Beautifully shot, Denny - the golds are magical here. That is a truly beautiful shot, Denny. 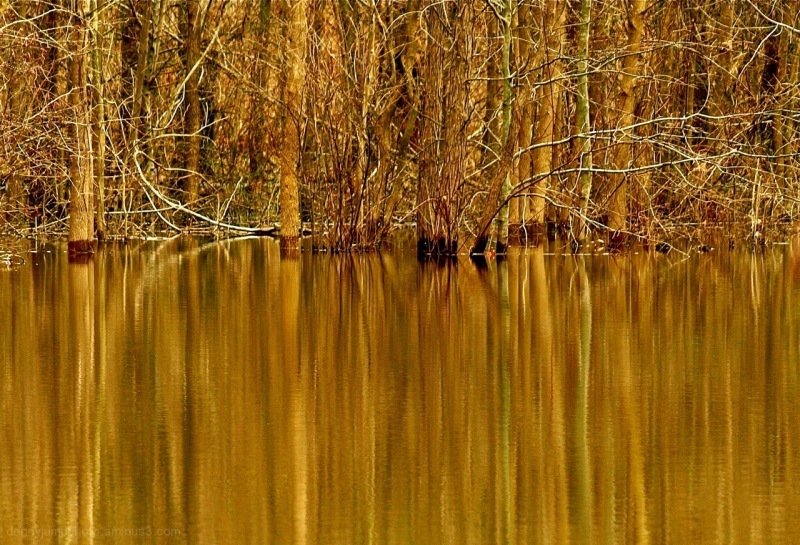 Your generous portion of reflection makes for a glorious bath of golds. Superb! @Rick: I almost titled this "Acapulco Gold" but it would likely fall on deaf ears...:-) Thanx sir! This is beautiful, Denny! Wonderful composition and balance...fantastic color! FANTASTIC reflections, Denny ... this is magical! Thanks for your warm comment on my post today. Denny this is just beautiful. Really lovely Denny. The beautiful warm gold & the contrast between top & bottom is just stunning. Incredible! I love these golden reflections. Gorgeous reflection! I love the color! A wonderful composition Denny! I like the vertical lines in this and the warm tones that give a nice touch to a winter scene! It sounds like your keeping very busy! Thanks for the thoughts and have a fantastic start to the New Year! Love this image, Denny. Very Impressionistic and the gold is absolutely marvelous! What a beautiful and strange contrast between the warmth of the image and cold of the pond. Wow, golden indeed. Nicely done. This is so lovely in it's simplicity and beautiful light, Denny! I just love the softly painted looking reflections in the water. @Tracy: Thank you Tracy :-) All the best! this is pure color spotlight material, denny! love the warm tonality and the gorgeous reflections! What a great reflection shot...The color is stunning. This is nicely done Denny, just wondering if there was any room to include even more water in the foreground and go for a long vertical frame? Worth a thought next time. Wow! Stunning composition that you captured so beautifully! Love that color! Beautiful way to find the interesting winter color. Nice!